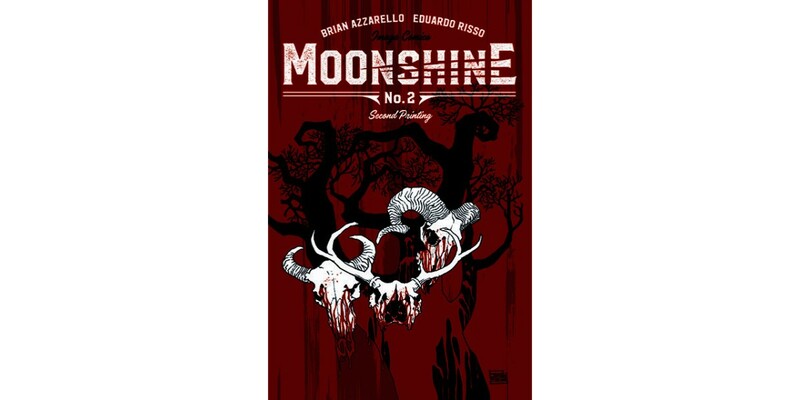 Image Comics is pleased to announce that the second issue of MOONSHINE by 100 Bullets creative team Brian Azzarello and Eduardo Risso will be sent back to print in order to keep up with increasing customer demand for the series. In MOONSHINE Part Two, Gangster Lou Pirlo thought he was stepping up in the NYC mob when he got sent to Appalachia to broker a big moonshine deal. Instead, he stepped right in the middle of a good ol’ fashioned family feud...and when one of the family might be a werewolf, things get bloody right quick. MOONSHINE #2 remains available for purchase across all digital platforms, including the Image Comics website (imagecomics.com), the official Image Comics iOS app, Comixology’s website (comixology.com), iOS, Android, and Google Play. MOONSHINE #2, 2nd printing (Diamond Code OCT168254), MOONSHINE #3 Cover A by Risso (Diamond Code OCT160622) and Cover B by Jock (Diamond Code OCT160623) will be available on Wednesday, December 14th. The final order cutoff deadline for retailers is Monday, November 21st.